Such acceptance is an advanced form of wisdom. We would not have the world we have today without the great increase in population and global warming. The population increases, and the warming of the planet, are keys to our current existence. Before 1927, when both these natural phenomena began, there was really no way to confirm our existence on a planetary scale. All our existence was fragmented and for the most part local. The current tribalism evident in Afghanistan and other societies underscores the local nature of earlier existence. Communications were difficult and travel from one place to another was to take your life in your hands. It was probably somewhat colder in places like Sweden and the Arctic than it is now. Being warmer can be a good thing, therefore. Even more so, without the population increase, there would not likely be a sufficient “customer base” for the launching of new technologies such as fast cars on fast highways, oil, gas and water pipeline systems, and the Internet and cell phones and crowd-sourced computer applications; not to mention ground-based rapid transit systems and the fastest travel by airplane. We would likely never have put a man on the moon; South Africa would still be a primitive apartheid-based society. And without population increase and global warming, both of which are natural processes, our scientists and innovators would not be motivated to develop more efficient methods of energy production and use, and better ways of marshaling the resources of our planet. We would not even be having this discussion if the population were still two billion. Furthermore, it’s not likely this discussion would be propagating globally via the Internet if the population were still two billion souls. Another major issue which is brought to the forefront by population and global warming is the subject of corporate responsibility for emissions and pollutants. Corporate responsibility was not even a term in use back in 1927 when the population was only two billion. The dumping of the detritus of production at the factory gate was the norm back then. I remember when I was a child, in about 1955. There was a creek that ran through an area of woods where I played, in the small town of Lexington, North Carolina. I was amazed by the rainbow of colors in this creek. One day it would be bright red, the next day bright green, and another day it would be bright yellow, and so on. Fortunately, I was just concerned enough to stay out of the water. There was a fabric dyeing plant nearby, and they were dumping their untreated dye residues directly into the stream. Most corporations inside the United States are doing considerably better at handling their wastes and runoffs than they were back in 1955. They are showing at least some degree of corporate responsibility, and it is appreciated. So in this essay I’m not going to hammer too much on corporations. I’m going to look at the flip side of the problem: the politically correct and seemingly magically effective solutions offered up by the environmental establishment: the green advocates. If only we could get our government to agree on forcing companies to meet carbon reduction targets, and to buy and sell carbon credits. If only we could spend multi billions of government and private dollars on wind and solar power. If only, if only. The list of impractical and expensive solutions goes on, and no one seems to be questioning the long term effectiveness of these more or less academic ideas; and no one is really questioning whether we even need to do these things. No one is asking whether any of these environmental “solutions” will “cure” the “disease” which may actually be a natural process, which we can live with if the genius of our scientific and political leaders is applied to direct solutions such as increasing the efficiency of internal combustion engines and reducing the weight of vehicles and other equipment used for freight and personal transportation. After we accept the reality of a changing earth and an increasing population, what we need is to find ways to imagine actual scenarios in the future and begin to invent processes and things right now to cope with these grounded visualizations of the next thirty to fifty years of the earth. The “New Earth” we live on demands us to care deeply about how we spend our money, and how we adjust to the changed living conditions which did not exist even 85 years ago. What about those who believe in their hearts that global warming and environmental pollution is the greatest disaster the world has faced, and the world must act decisively to combat these threats to our planet? Marinette Forbes-Magno has a master’s degree from the Asian Institute of Technology, and has researched energy issues in Thailand as a professional. She’s a member of my family and is visiting in my home as I write this. She says that global warming brought about by massive population increases will inevitably lead to major environmental disasters. These natural disasters will wipe out the excess population and only after this happens will we return to a more normal way of living. This is not necessarily the way it will happen, she says, yet it’s one way to look at it. She’s worried, that’s for sure. Yet she’s not a doomsday prophet, she’s simply a well-informed concerned citizen. The label of doomsday prophet belongs to the loud and robust environmental activists and politicians –think Al Gore – who are constantly bombarding us with messages that we have to do what they tell us to do; and spend billions to implement schemes of dubious or unproven effectiveness to “reverse global warming” (Bill Clinton’s words). The label of doomsday prophet also belongs to the lurid and showy television pundits, and the networks with 24-hour news cycles which must be filled with words and pictures – think CNN. They get better ratings if they really scare people with the rash predictions made by interviewees with personal agendas, and the endless loop reporting on every storm and earthquake on the face of the earth. My daughter Michelle Kathryn McGee, www.healinggeneration.com is concerned that what I’ve been saying about the environment in my series of blogs is a convoluted justification for constant striving rather than constant being — which means being willing to face contradiction fearlessly at every turn. She is personally concerned about the degradation in the quality of life brought about by global warming, yet global warming per se is not the problem. There is, she says, a bigger need for a raising of human consciousness, and she wants each person to take on BEING the solution to a different, more important set of problems. It’s not our planet that is the problem, it’s the level of consciousness and awareness each of us brings to our everyday living that is the problem. The environmental activists are pushing a hundred doomsday scenarios; rivaling the preachers of the “end times” rapture, where only the saved will be taken into heaven. These dramatic doomsday scenarios are endlessly looped to the public and to the politicians, until everyone believes in them regardless of the evidence to support them. Believing in such disasters is much easier than if someone says we must examine our own personal levels of consciousness to find our way home, and take personal responsibility for our part in what happens next. Pushing “easy solutions” – which claim to have the remarkable ability to totally head off the natural and artificial disasters threatening our planet – seems to be the most popular way of addressing the claims of environmental degradation. That these easy solutions, such as solar and wind electrical power, carbon offset credits, and battery powered cars, are incredibly expensive, and are so far unproven as primary methods of carbon emission reduction, doesn’t stop us from embracing them as tightly as is they were our first-born child. There are even people out there who are persuading us to spend huge amounts of tax dollars to set up a system to predict when a rogue asteroid or meteor might crash into the earth, so we can take defensive measures. This could happen at any time, they say, or at least within the next thirty thousand to a million years from now. Budgets are already being prepared for submission to governments. Our collective disaster-consciousness is a big step away from reality, and from the true measure of human consciousness, which is: who are we BEING right now, in this moment? How can we be a part of generating peace and awareness within ourselves? How can each person, from elected official to corporate officer to hamburger-flipper, take responsibility for our own part in the ongoing “drama” of daily life? How can our systems be re-calibrated to move our thinking away from disaster and into the fullness of a well-lived life? For example, what is the primary obstacle to our doing our daily driving around town and to and from work in golf-cart sized battery-powered vehicles made of light plastic parts? It is this: If I tried to drive out into the traffic on the local road right out in front of my home in a “golf cart” type vehicle, I’d be terrorized and traumatized by all the big-engine roaring steel cars going as fast as they can, almost bumper to bumper. I probably wouldn’t make it a hundred feet before I gave it up and parked the little plastic buggy and walked back home to get my full-sized car, to protect my life and sanity. If I continued driving along in spite of my fear, I’d probably be arrested by the police for blocking traffic and being on a public road in a nuisance vehicle. Far more than half of the driving in the United States is for distances of thirty-five miles or less round trip. These trips could easily be made in golf-cart sized vehicles, if such vehicles were allowed and provisions were made for their safety, and they were cheap enough. Most people would still want another full-sized car, for longer trips and on bad-weather days. Why is there no public dialogue about smaller light-weight vehicles? First, in our country the road still offers more freedom than frustration. Three-quarters of Americans say driving often gives them a sense of independence, and nearly half say it’s often relaxing. Four in ten love their cars — not just like them, but love them. (This is from an ABC News Analysis by Gary Langer, February 13, 2005.) I’m definitely one of those freedom-lovers. I’m also one of those four in ten who love my own big heavy car. I’ve already made the internal shift to driving a small car with a small fuel-efficient engine. It would take a further cosmic change within me before I’d emotionally adapt to driving around town in a golf-cart car. Can I adapt? Yes. I. Can. Will I adapt? Only if the whole system of traffic is re-calibrated to make me feel safe and wanted in my light-weight golf-cart sized car. And yet I don’t see or hear any politicians or environmental activists howling for a new traffic system that will accommodate light-weight individual vehicles. Any such vocal activists would probably be opposed by the auto industry and the highway construction industry. Maybe we could make it more palatable by promoting light-weight car lanes as a new infrastructure project which will help create jobs to get us out of the recession. You think? This is part three in a four-part series. At this time in history we live on a “New Earth,” a planet which has conditions which have never before existed in human history. Current environmental problems come from many natural changes in the earth’s environment. One very significant natural change is population. The current population of the earth plays a major part in the explanation of the presence of all our environmental excesses and disturbances, including the rise of mega-corporations and huge polluting factories, water shortages, the extinction of species, deforestation, and the huge islands of plastic bags floating in the North Pacific. This is an explanation which per se does not allow any solutions of any kind which do not include the bare fact that five billion more people have been added to the population since 1927. Reducing the population by five billion is not even remotely within the realm of possibility. Current initiatives in “population control” are like using a wine cork to stop Mauna Loa. Even if the rigorous efforts at population control now used in China were extended world-wide, there would be no decrease in population, only a slowing of the increase. I feel that many of the post-apocalyptic, alien invasion type movies and novels are metaphors for that which we cannot ever say: at some level we wish we had five billion fewer people on the planet. Even the current fear of earth being hit by a meteor could be a form of unspeakable wish-fulfillment. It’s not every day you can actively imagine billions of people being destroyed by a faux-scientific means you can’t do anything about. The purpose of this essay is to show that all our efforts to stop global warming and pollution with our present technology are doomed to failure. All the talk and all the effort is no more than dust in the wind. Further, the only way to move forward is to admit that we cannot really control the natural changes brought on by massive population growth, and to find ways to live with the changes in our planet. These changes have been a natural phenomenon brought about by the burgeoning numbers of humans using the same amount of space and resources as were formerly used by a great deal fewer persons. I choose to look at the situation not with gloom, but with hope. The hope is that our efforts at managing the changes in the atmosphere and temperature and pollution of the earth will take into account the incredibly massive increases in population as a given fact. As long as we ignore this simple fact, we will not be able to learn to live with and master the new atmosphere and temperature and pollution of the earth. If we accept this truth as a bottom line, we will find better ways to move forward and live with the “New Earth” and its changing environment. The sudden increase in population is a phenomenon never before seen on our planet. We can’t look at history; there are no precedents. Yet what is happening is natural and is real. Let’s look at the numbers and do some simple math. According to Time magazine the population of the world as recently as 1927 was only two billion people. The few environmental advocates at that time were mostly concerned with stopping the dumping of poisons and caustics which were the by-products of manufacturing. There were no global warming activists, and frankly, there was no need for them. 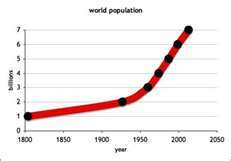 Here’s one chart which shows the absolutely stupendous and phenomenal growth of human population. The black dot showing the passing of two billion is right close to the year 1927. Before that time there had never been even as many as two billion people on the planet. The black dot showing the passing of seven billion is right close to the year 2011. To begin this analysis, let’s forget about the industrial and sewage and plastic bag and CO2 pollution. Let’s start by looking at the people themselves, the inhabitants of the planet as human bodies only, without reference to what they do. Further, let’s concentrate only on the five billion people who’ve been added in the last 84 years. Each human being maintains a body temperature of 98.6 degrees F, making each human body a little furnace of its own. A resting person puts out about 100 watts of energy at any given single moment of time, dispersed around the whole of the body. If you want a clear picture of what this amount of energy feels like, put your hand close to a 100 watt light bulb, where the same amount of energy is concentrated in a very small globe. Thus our five billion new inhabitants produce heat at the same rate as if there were five billion 100 watt light bulbs burning all at the same time, all the time. Boron & Boulpaep’s Medical Physiology says that the body’s rate of heat production can vary from approximately 80 calories per hour at rest to 600 calories per hour during jogging. So let’s conclude conservatively, including children, that the average heat production of each human body is about 90 calories per hour, or 2160 calories per day, released into the atmosphere. Since the calorie is not the standard measure of heat, we have to convert the calorie into heat energy, as measured in scientific standard “joules.” We start with the statement: The calorie approximates the energy needed to increase the temperature of 1 kg of water by 1 °C. This is about 4,184 joules of heat. Therefore with a bodily heat production of 2160 calories per day, multiplied by 4,184 joules, we come to the individual human body giving off about 9,037,440 joules of heat a day. Thus the five billion people added to the planet since 1927, as human bodies and nothing more, are giving off or radiating 45,187,200,000,000,000 joules of heat a day. That’s 45 quadrillion joules a day. According to www.rapidtables.com, the power P in watts is equal to the energy E in joules (J), divided by the time period t in seconds (s): P(W) = E(J) / t(s). There are 1,440 minutes in a day, and 1 joule of heat per minute equals about 1.6 watts of energy per minute, or 2,304 watts of energy per day. So multiply 45 quadrillion joules by 2,304 and divide by 100. The five billion new people on earth since 1927 thus naturally radiate from their bodies every single day the heat equivalent of 1,036,800,000,000,000,000 hundred-watt light bulbs. That’s the heat energy from a little more than one quintillion light bulbs a day. Multiply that number by the 365 days of the year, and you have a natural human body radiation of the equivalent of 378,432,000,000,000,000,000 hundred-watt light bulbs of heat a year into the atmosphere of the Earth. That’s 378 quintillion hundred-watt bulbs a year of heat generated by the five billion extra human bodies added to the planet since 1927. Now you have the tip of the iceberg (a bad metaphor, I know) of global warming. This heat radiation is a totally natural phenomenon which is not subject to change by legislation or good intentions. Next, let’s look at the external heat generated outside the natural heat of their own bodies by the activity of each of these five billion human beings added to the earth since 1927. Assume only the minimum: each of these persons has a cooking fire and a single electrical light fixture, and each person in temperate or cold climates has a single heating stove. I won’t bore you by computing the additional amount of heat generated by these natural activities outside each human body. Multiply five billion by whatever number seems appropriate to you. Now you have the second element of global warming. This normal use of heat by humans is also a totally natural phenomenon which is not subject to change by legislation or good intentions. Moving on, it is a commonly held scientific assumption that one of the drivers of global warming is the increase in levels of greenhouse gases including carbon, CO2, in the atmosphere. These greenhouse gases trap heat inside the atmosphere and prevent it from radiating back into space as it has done throughout human history. Make up your own mind after studying this graph. In my humble opinion it speaks for itself. There is no doubt that there are many other factors affecting global warming, yet deliberately ignoring the increase in population as a major factor is working with blinders on. And we must assume that the population will never decrease. The most we can expect is that at some point population will begin to increase at a slower rate. The “New Earth” will always from this point on remain a very populous earth. Thus population must be taken as a given, an unchangeable natural factor with which we have to deal in discovering better ways to live on our “New Earth.” There’s no going back, and no pretending that we don’t have all these heat and carbon emitting souls on our planet. Simply changing our ways by herculean efforts to reduce carbon emissions and stop industry from polluting is not going to make even a small difference in global warming. “Changing our ways” to save the environment is a little like trying to empty Lake Champlain by dipping it out with a teaspoon. We must instead focus on ways to live with the new environment which has developed around us, and new technologies which will enable us to prosper as a species in light of the non-reversible changes which have overtaken us. According to James Famiglietti (UC-Irvine) et al. (2012), one of the other factors scientifically demonstrated to contribute to the rise in sea levels related to global warming is groundwater depletion. Fresh water, up until recently locked in the land, is being pumped out all over the world to irrigate crops and mitigate droughts. That extracted groundwater runs off into rivers and is ultimately added to the oceans, increasing the sea level by meaningful amounts. Groundwater depletion is without question entirely a product of the vast increase in population on the planet. The same goes for carbon emissions from giant electrical utilities, factories and internal combustion engines. The greater the population, the greater is the need for larger and more electrical production utilities, larger and more factories to produce goods, and more and more vehicles with internal combustion engines. In China and most third world countries, greater populations mean more carbon-rich wood-burning fires for cooking and heating. On any given day at least two billion wood-burning fires are started world-wide in hearths where these fires are the only means of cooking and staying warm. It would be very difficult to make a case for these people to stop making the fires which are necessary for their daily survival.